Take the other night, for example. NOT the prime equation for my hyperactive imagination. Lock and bolt the front door. Lock the glass dining room patio sliders. Jump into the tub. Shampoo. Distinctly hear the front door opening and closing. Freak out a bit when the dog barks. On second thought, I'm SURE it was... maybe someone came home early. I turn off the shower and listen. Dog whines and barks again. Freak out a little bit more. (Okay, okay. A LOT more). Gory scenes from Psycho and every other slasher movie I have been stupid enough to watch fast-forward through my mind. And just like the doomed idiots in those movies, I climb out of the shower, wrap a towel around my dripping, soapy self and exit the bathroom with shampoo lather dribbling down my back. Leaving a trail of water as I tiptoe down the dark hallway to investigate, I check every door and every window ... whilst unsuccessfully attempting to push the image of a hockey-masked serial killer wielding a butcher knife from my mind. I return to the bathroom to finish rinsing off, only to pause at the door. What if someone is hiding behind the shower curtain? Thank goodness it was only your imagination! I hear lots of things while I'm in the shower too. But it's usually my son getting into trouble. I'd rather it just be my imagination! Oh Maureen... this is a good post! I can relate so well! Why oh why do we "hear" things at the most inconvienent times! And just what did you think you were going to do if you encountered a burglar... drip on him? Ooh... maybe you could shake your hair and fling shampoo into his eyes. That would teach him! Ooh ooh... even better - snap him real hard with your towel! No scratch that - he would probably like that. Heather: Hah! Yeah, kids THINK they know when it's safe to get into trouble, don't they? Darla: Thanks...I know! Have a great weekend too! Jessica: That stupid movie enters my mind nearly every shower... damn him! Jeff: HA HA HA!!! Yeah, the burgler would be screaming "My Eyes! My Eyes!" and NOT from getting shampoo flicked into them. No, that would be his response to my towel removal... Har! What if there was somebody there and you're actually dead but you don't know it? What if this is just a giant computer simulation and you're in a goo infested cell creating energy for machines? What if the force WASN'T with us? What if your shower curtains were avacado green? What if the tub suddenly started to drain counter-clockwise? lol ... you need to be alone more! 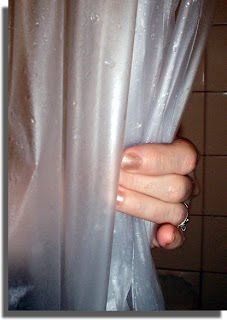 I live alone, but I do have a see-thru shower curtain ... ever since I first saw Psycho ... it's gotta be see thru! I guess it won't help when I tell you this happened to my sister-in-law. In the shower. Husband still sleeping. Stranger enters bathroom. Freak out of the highest magnitude. Turns out the guy was looking for a woman who lived in the back part of their split residence house. He got it SO wrong. Sister-in-law screamed bloody murder. Husband awoke. Ran naked after stranger. Stranger wet his pants. Guy's lucky he didn't get killed. I used to have a room mate who would sleep with a knife under her pillow when the rest of us were gone for the night. When I'm home alone, I tend to think I still hear my kids voices in the house- it's odd. Don't forget the plughole... another point of entry!! hehe. I'm the same way. SO the same way....and I love what Jeff said...what are you going to do drip on him??? hehe. exactly. I'd at least scare him with the size of me arse!!! God Maureen I am just like this. I have to check out all funny noises, check and re-check the doors and double check the alarm is on. We have one that you can put on when you're upstairs so I always use it and it does make me feel safer. Damn, that's why I hate taking showers when I am home alone and guess what? I am home alone all the time now.I don't think the Uberhund is going to be much protection either. he is just going to wag his tail a lot. Brrrrr!!! I used to be the same way. But then my husband started the graveyard shift (and worked it for 3 years), so I knew I'd HAVE to get it together. Sleeping with the light on does not result in refreshing night's sleep. You sound just like my wife and her pre-shower home alone routine. VE: Then I would have to call on Haley Joel Osmet. Hmmm… take the blue pill or the red pill? Then I couldn’t help Luke at all! Then I would be in the 70’s… and then I knew I was at the Bates Motel. Did I get them right? Drowsey Monkey: You know, we usually DO have the crystal clear one too (for exactly that same reason)… but last time they were sold out (obviously this is a wide-spread phobia) and I had to take the semi-transparent one. Jen: Yikes! It’s amazing she didn’t cut HERSELF! Brom: Oh, thanks….. even MORE to worry about! Jo: Glad to hear I’m not the only paranoid one. Irene: Oh, but you are much braver than I, Irene. But Jesker can attack them with cuteness, no? Ed: Hah! Yeah, kids just know when the best opportunity presents itself, don’t they? I never hear ANYTHING when I'm in the shower, except water running, of course. I guess it's a good thing I also have the "ultimate guard dog" roaming around my house. My Sheltie will bark any intruder's ears off! I guess we are not your normal Canucks either; we lock our doors ALL the time - especially since that crazy old lady and her daughter walked right in one New Year's Eve. The daughter was so embarrassed, her mother was furious at us for being in her other daughter's house! LOL! I do this when people are home and freak myself out. I hate when I feel vulnerable and in the shower is a huge time of that for me. And of course my husband just LOVES to scare me when I am in there and unaware. And that is why I am all for arming dogs. They'll even take the rap, tail a waggin. Phoenix5: Ha! Well, I guess I would lock my doors if that happened to me too! Vegas Princess: Oh, now that is just mean... sounds like something MY hubby would try, if he only knew how freaked I get. BusyDad: Ha! Yeah, I've seen your two; they would probably lick an intruder to death... or chew on those squeaky toys and render the burgler deaf. I'm the same, I always hear "something" as soon as I'm in the shower when alone at home!